Burger @ Burger & Lobster, innit. Good. 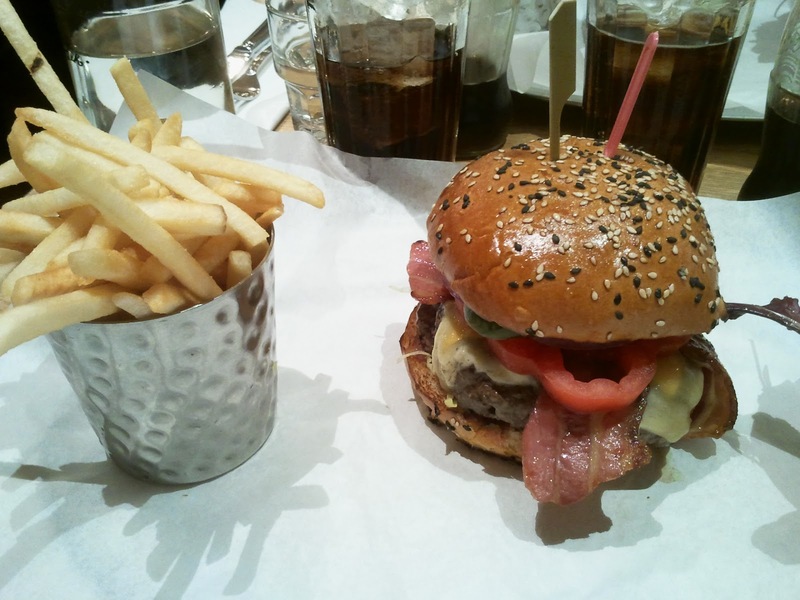 Burger, fries and salad are presented on a silver platter, covered with greaseproof paper. Burger comes with a skewered lid to hold the beast of a burger together, but with solid construction like this, I doubt it's needed. 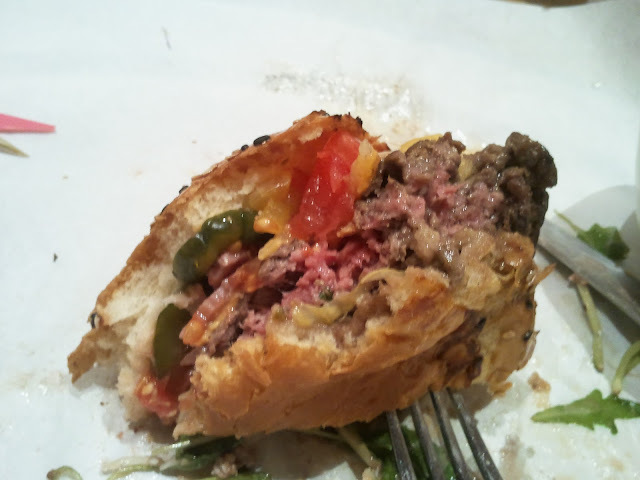 Also sticking out of the top bun is a little plastic medium-rare marker. It's like a nation of little people have negotiated the craggy burgerface to plant their flag at the toasted sesame seed pinnacle of my burger. Or it might be a bit Nando's. Fries are served in their own silver beaker, and the salad is similarly self-contained in a bowl of it's own. Mixed bag. 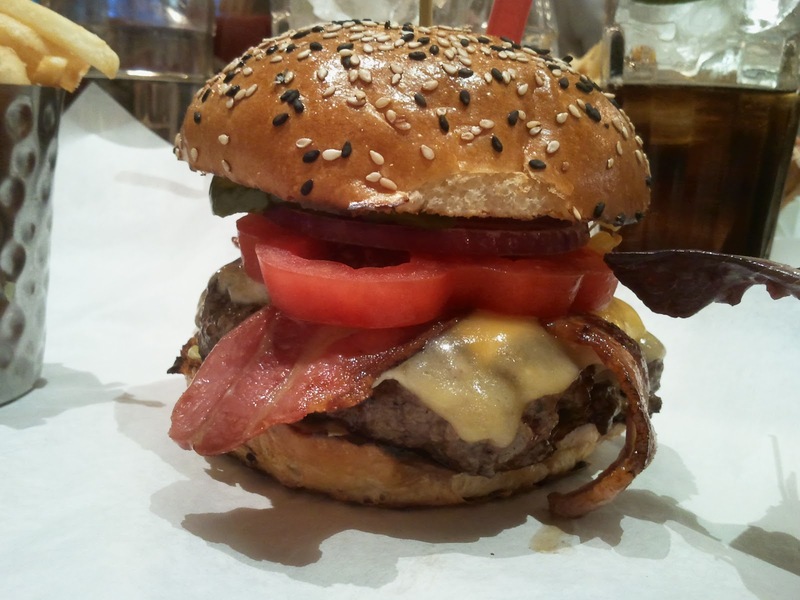 The back bacon headed straight to the top of the list - meaty, salty tongues of joy criss-crossing the patty. 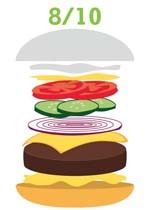 Cheese was a mixed bag - there seemed to be TWO types of cheese melted onto the burger - a thin slice of medium-mild cheddar, translucent with melting, and then a second layer of bright yellow american cheese, underneath. Now I'm not one to complain about double cheese, but the aesthetic was...odd. Tasted good, and added tang and texture to the meat. The slice of beef tomato was a bit disappointing - looking more like a ring of red pepper, but without any of the vine ripened concentration I expected. It was a bit watery. If it's UK-grown, it's a victim of our British summer. And then the dill pickles...sad bits of soggy, underpickled cucumber, again lacking that vinegary bite I like in bepickled burgers. Very, very good. This is a lightly seasoned, melt-in-the-mouth, perfectly medium-rare (the little flag told me it would be), coarsely-ground aged-beef patty. I'd wager there's a fair bit of rib-eye and/or cap as the fat ratio is pretty high, and your teeth go through it like butter. 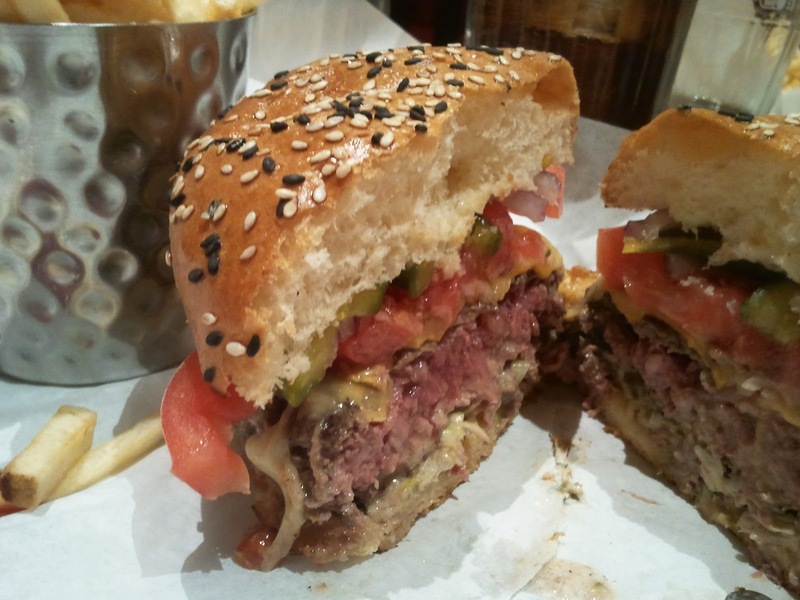 Burger & Lobster burger cut-through - it's all about beautiful layers. Very good. The bun is a heavily glazed white bun with a touch of brioche sweetness about it. The toasted sesame seeds added a great crunch which contrasted well with the buttery meat and very fresh baked bread. Unsurprisingly the bun stayed intact for the duration - something I've come to expect, but especially in a burger with a £20 price tag. Fries were excellent - crisp, hot, salty - and plentiful. 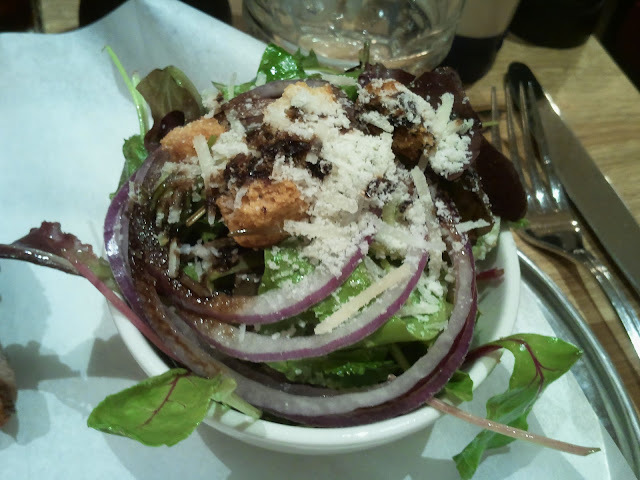 Salad was good, mixed leaves were dressed well and topped with grated parmasan, but the onion was a bit piquant for a Tuesday lunchtime, I'm sure my colleagues would have been happier if I hadn't chomped it. Obligatory salad shot. Burger Me! promotes healthy eating. Don't try this at home. My visit to Burger & Lobster was on a Tuesday lunchtime, and with no queue, the whole experience was smoother than a glazed brioche bun. 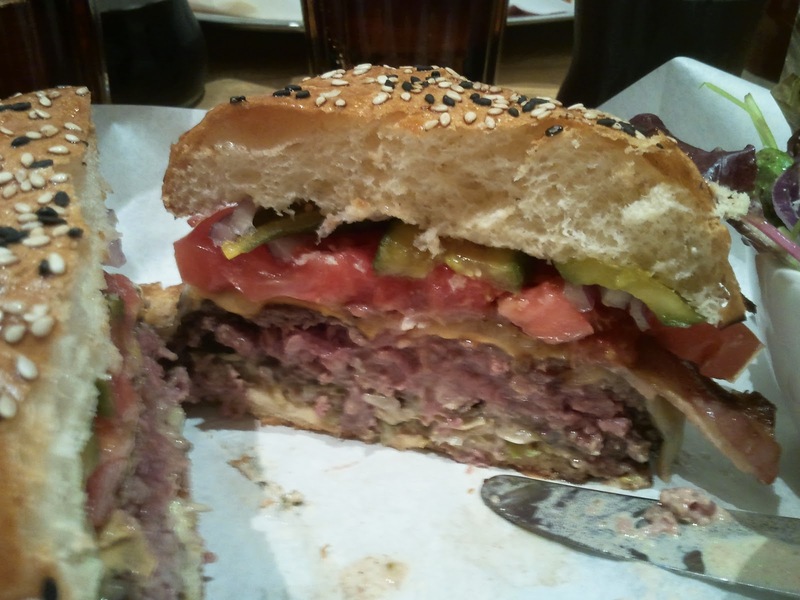 The meat was exceptional, the bun very good, and the quantity excellent, but there were too many elements that didn't quite go together for me. The Nando's flag. The underpickled pickles. The watery tomato. 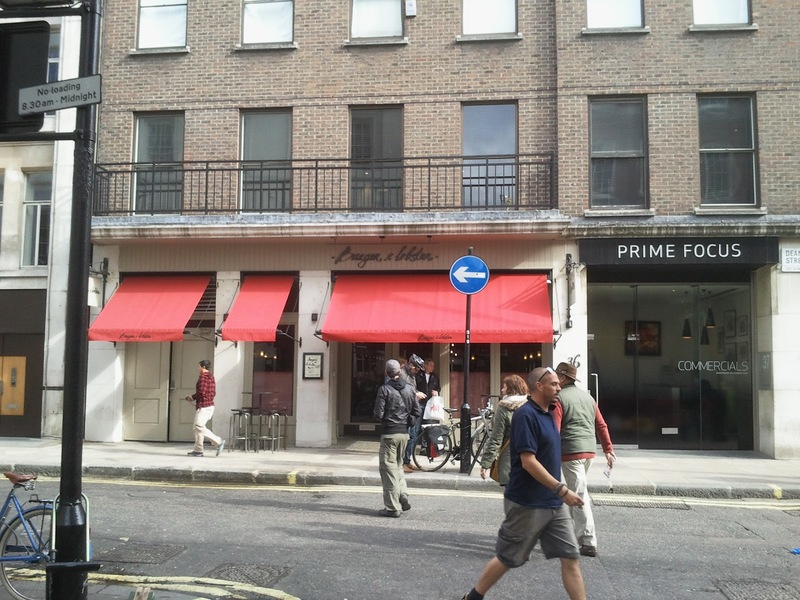 Don't get me wrong, I really enjoyed my burger at Burger & Lobster, it's a very good burger, but for £20, I want amazing...still, it's much better than Gaucho. That tomato is a bit of a dobber!! Looking good apart from that, I'll have to save up before trying it for Burgers and Bruce!